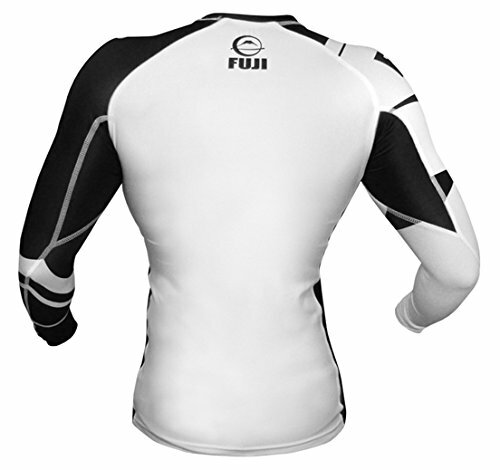 Fuji Freestyle rashguard is incredibly comfortable and surprisingly cool even during intense workouts. It has a nice cut and fits perfectly, smooth fabric allows for easy low friction grappling. It has a comfortable collar that doesn’t cling to your neck, which is great. Wearing this rashguard is like grappling without a shirt, but with a layer of protection against your sweaty opponent. The longs leeve rashguard works fine under the gi also, I much prefer wearing this than a t-shirt, and it is much more comfortable than most sports compression shirts. I’m 5’8 around 170lbs with broader shoulders. The large fits perfectly. Fuji generally makes quality products, and this is no exception. The stitching is great, no signs of breaking down after over 100 washes. I’ve done over 100 hours of classes and randori in this and it is still in tip top shape. It definitely soaks up some sweat, so don’t let it sit in your gym bag, wash it as soon as you can. No complaints. This is a pretty standard rashguard design, and it is IBJJF approved for No-Gi competitions. You can get it in any belt color, and the fabric is an antimicrobial blend of polyester and spandex. The graphic layout is pretty cool, but not too flashy, with a few Fuji logos and Mt. Fuji on the front. When I first got it, the rashguard was a bit shinier, but the fabric actually feels better now that it’s worn in. There are some much more interesting rashguard designs from Fuji, with outlandish and artistic graphics. This standard design is good for denoting rank in No-Gi tournaments, and there are options all the way up to black belt. If you’re looking for a good basic rashguard, you can’t go wrong with this one. It’s definitely worth the price, especially once you start comparing to other brands. That being said, there are other option in this price range, it just depends what you’re looking for. I got this Fuji Freestyle Rashguard about a year ago after using a short sleeve one, and one of those Nike compression shirts. This rashguard has been great. I purchased this Fuji Freestyle Rashguard at full price. This did not affect the outcome of this review, written after 1 year of training with it.